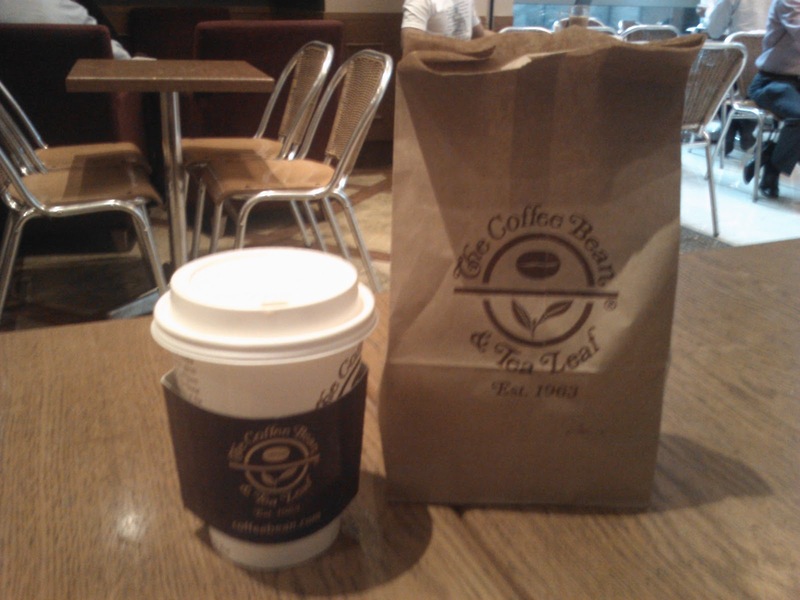 Previously, I talked about cakes and desserts that I got at The Coffee Bean and Tea Leaf. You can check out the article here. Today, I'm going to talk about the delicious beverages that are sold here. Sometimes, we just want to have an expensive drink to indulge instead of the usual soft drinks we get from the fast food restaurants. 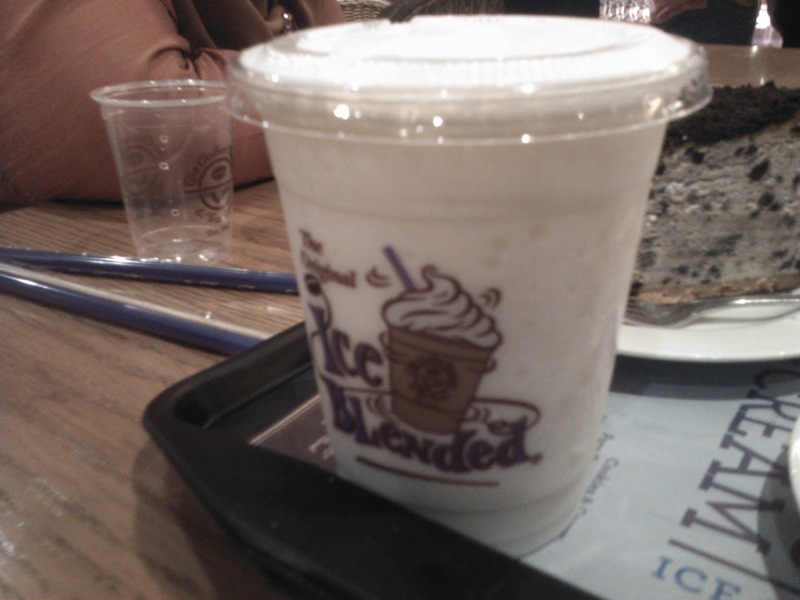 The Coffee Bean serves a lot of drinks from coffee to lattes to ice blended drinks. 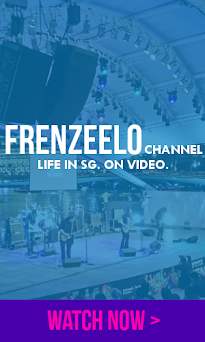 Do note that one small drink can cost about 5 to 6 Singapore dollars and it's certainly something you should indulge in once in a while. Let's check out the beverages that I got from the Coffee Bean. First up is the Full Cream Milk. This drink is totally free. All you have to do is just visit the condiments counter, get a small transparent cup, pour the milk from the thermos into the cup itself and there you go, a free drink from Coffee Bean. Other flavours include plain water and sugar syrup. Okay okay, this isn't an official drink but you can get yourself a small cup of plain water if you want to wash down the sweetness in your drink. Or, full cream milk if you want to make your drink tastier. Though I suggest you to get an actual drink from the counter then get yourself these otherwise you get dirty stares from the staff. Best thing is, they're totally free. Available during Christmas season 2011, this is the Candy Cane Tea Latte. It has black tea infused with candy cane and lots of milk. This beverage has a nice peppermint flavour and the milk totally complements the peppermint. It's nice and hot and it's a great comforting drink every peppermint lover should try. Unfortunately, it's only available during the Christmas season in 2011. Who knows? Maybe a new selection of beverages will be released during this year's Christmas season. This is my favourite beverage at The Coffee Bean. It's the Caramel Ice Blended. The one without coffee is called the Pure Caramel Ice Blended. I've tried both before and I have to say, the Pure Caramel version is better. Well, maybe because I'm not really a big fan of coffee so I tend to get the "Pure" of this drink. I did try the version with coffee before by accident so yeah it really isn't that tasty compared to the 'Pure' version of this drink. If you're a fan of caramel and coffee, you can get the regular version of this drink. If you like caramel but don't want coffee, get the 'Pure' version. This is a hot drink from the cafe itself. Apart from the iced drinks at the Coffee Bean, there's also a wide selection of hot drinks for sale too. I got the Hot Vanilla and Chocolate Chip Muffin as seen from the picture above. The Hot Vanilla is simply a no frills Vanilla and milk flavoured drink. Nothing special but I like it. When I get hot drinks from here, it's either I get this or the English Breakfast Tea Latte. Speaking of tea lattes, there's also a wide selection of tea lattes available if you're a die-hard tea lover. Get yourself a muffin or cookie and pair it up with your favourite hot drink here and you get yourself a nice and filling snack. This is the ice blended version of the drink that I just mentioned above. It's called the Pure Vanilla Ice Blended. This doesn't come with coffee just like the ice blended caramel although you can get it with coffee. 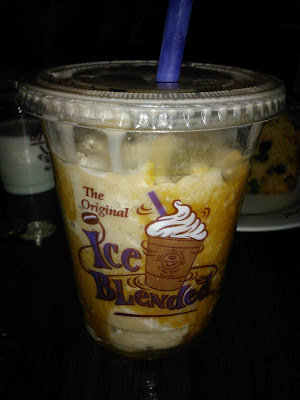 Just mention "Vanilla Ice Blended". Yes, you may be confused at why I said you can get it with coffee when clearly it's a white vanilla drink. Some ice blended drinks come in two versions. One is a regular version with shots of coffee blended with ingredients whereas the "Pure" version is the one without coffee just the other ingredients. Get it now? Surprisingly, the Hot Vanilla I mentioned above only has one version which is without coffee. Anyway, when you get to the outlet, you can see it for yourself. 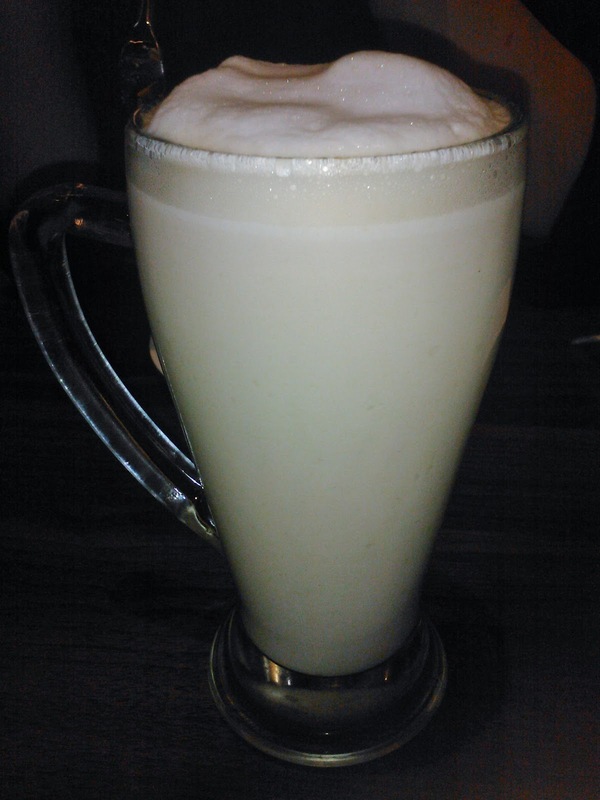 This drink is delicious with the milk and vanilla all blended together. It's tastes just like vanilla ice cream in a cup with a straw. These are the last two drinks that I'll mention in this article. The one on the left is the Hot Vanilla which is the same as the Hot Vanilla I mentioned above. 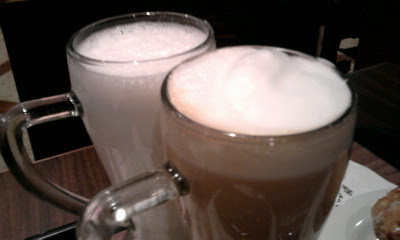 The one on the right, is the English Breakfast Tea Latte. 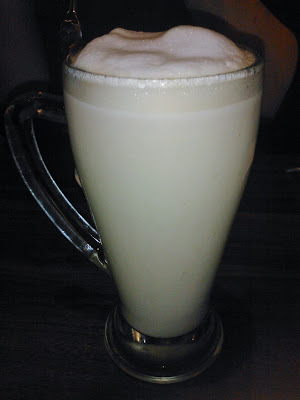 This tea latte is like the higher class version of Teh Tarik. Google it if you don't know. The English Breakfast Tea Latte is essentially English breakfast tea mixed with milk and has that nice frothy milk at the top. It's delicious. Even more delicious than the Hot Vanilla. If you are tired of the usual Milk Teas or the famous Teh Tariks, you can get this more expensive alternative. It goes well with the muffins. 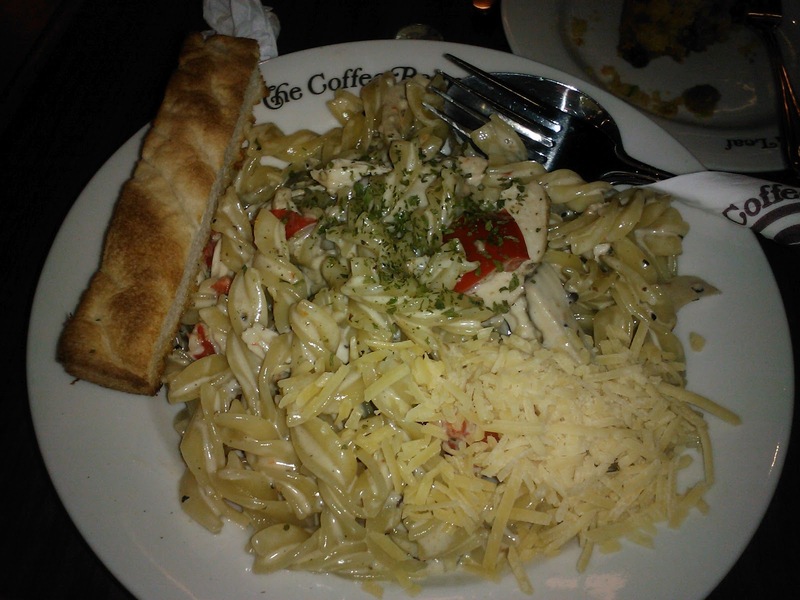 Sure, this isn't a beverage but the Coffee Bean also serves very nice food too. I got the Chicken and Mushroom Fusili. It's a pasta dish filled with fusili pasta, some herbs, lots of cheese, a breadstick, pieces of delicious chunky chicken, pieces of juicy mushrooms and some capsicum slices. It's heavenly and the portion's big for 11 bucks. It's tastier than Pastamania plus the pasta dish also has lots of toppings and ingredients. The presentation was also beautiful. Best of all, there's no service charge. Each Coffee Bean outlet will have a range of pasta dishes along with some other dishes like all-day breakfast, scrumptious sandwiches and delicious fruity frozen yoghurt. Great place for breakfast, lunch or dinner. 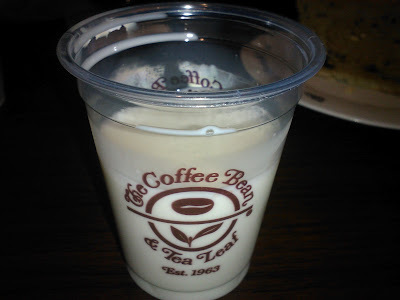 All in all, The Coffee Bean also makes delicious iced and hot beverages along with the usual delicious food and desserts. If you have sharp eyes, you'll realise that there's no mentioning of any coffee drink even though the cafe is coffee-oriented. Well, that's because I'm not really a big fan of coffee drinks and coffee. I have tried some coffee drinks before and indeed they were delicious but I don't have photos of it. Maybe next time. Try visiting a Coffee Bean outlet and see what they have to offer. Most of the outlets also have free WiFi for your internet usage and they have comfortable seats. 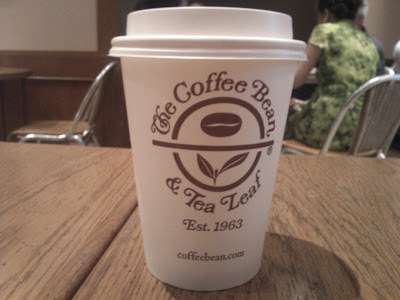 Visit the nearest outlet now as The Coffee Bean is available islandwide. Comment Question: Tea or Coffee? Why? لا أحد يختلف على أنه يوجد عدد كبير من شركات التنظيف لكن لا يسعك بالطبع وضع ثقتك في جميعها لذلك ننصحك بضرورة التواصل مع شركة تنظيف بيوت الفجيرة إذا وجدت صعوبة في تنظيف منزلك وستجد لدينا كل ما ترغب فيه وتسعى للوصول إليه من أهداف حيث أننا نعمل جاهدين على تحقيق أفضل النتائج التي من شأنها الحصول على استحسان جميع عملائنا الكرام في أقل وقت وبأقل تكلفة فلا داعي للتفكير طويلا في الأمر بل اتصل بنا الآن. مهما كانت ضخامة المبنى الذي ترغب في تنظيفه فشركتنا المخضرمة شركات تنظيف المباني في الفجيرة قادرة على تنظيفه والعناية به. تعمل شركة تنظيف بيوت الفجيرة على تنظيف الواجهات الزجاجية والحجرية التابعة للمباني. يمكننا تنظيف جميع المقتنيات المصنوعة من الزجاج ومن ثم تلميعها دون إحداث أي خدش بها أو تعريضها للكسر. بما أن المنازل لا تخلو من القطع المصنوعة من الرخام فنحن قادرون أيضا على جلي الرخام وتلميعه جيدا وإزالة الأوساخ المتراكمة عليه. إذا رغبت في التواصل مع شركة تنظيف بيوت الفجيرة فيمكنك القيام بذلك في أي وقت ومن أي مكان حيث أن فريق خدمة العملاء التابع لشركتنا المتميزة متواجد على مدار اليوم لاستقبال جميع المكالمات الهاتفية التي تأتي من أي عميل كريم.